This botique family owned vineyard has stunning views over-looking the Waipara River. The unique Syrah block can only be described as 'mind blowing'. Clinging to a north-facing slope at a 45 degree angle, the vines are tended purely by hand. This is undoubtedly a labour of love. Pete the viticulturist explains, "More precisely, it's a love/hate relationship - we love the wine it prodcuces but at times the workers wilt in the sweltering 40deg summer temperatures!". Terrace Edge is unashamedly passionate about producing quality wines that accurately reflect their surroundings. The sun-drenched terrace edge descends sharply to the Waipara River, creating an exceptional place for growing grapes. 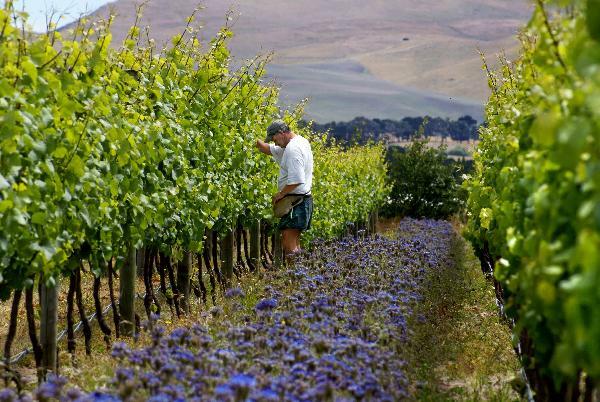 Our family truly believes that premium wine is first hand-crafted in the vineyard, exclusively using natural, organic growing methods and meticulously hand-tending the vines. Taste our dramatic landscape, captured in liquid form.